As a savvy foodie, I like to travel in style, but sometimes having the proper cookery and cutlery is not always easily transported. After spending a large portion of the morning at the farmer's market (buying new inventory of fresh herbs and spices), a light and tasty lunch was next on the agenda. When it comes to wanting a gourmet lunch on a (humid) summer day or having an intimate picnic in the park, it's often a challenge to keep it simple. The last thing that you want is to have shoddy kitchen tools. There's nothing like having an excellent cheese platter or bottle of wine ready to enjoy whilst lacking the corkscrew and proper cutlery. We packed homemade French baguette sandwiches, cucumber-basil flatbread for smoked salmon pizzas, honey-dipped baby carrots, and peaches with blue cheese, amongst other succulent edibles. In collaboration with WÜSTHOF, the abundantly renowned producer of premier knives, it was a pleasure to review a few essential pieces from their collection, the CLASSIC 7-Piece Traveler Set. Firstly, when you see any WÜSTHOF design there's an unequivocal precision and aesthetic at a glance — the weight, blade quality, and well-made triple riveted handle comfort — sets them apart from other knife brands. But, their commitment to sustainability and environmental awareness is all the more reason to understand why they have been at the top of their industry and in the business for over 200 years. To put it mildly, saying, "A knife is just a knife," is like saying that a shoe is like every other shoe, and we all know that soles have dimensions and various calibres of greatness. Putting this set to the test in the kitchen myself made a lingering impression as it didn't take much to cut crisp veggies and fruits beautifully, even as a lefty. 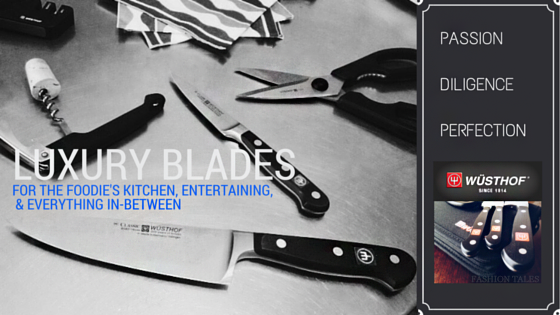 These German-made knives are credibly the best blades in the kitchen business. This traveller set made it effortless to carry some of the most important and most-used cutlery pieces, which in fact was suiting for a packable blanket-style lunch. However, this set would also be great for an outback foodie enthusiast or travelling epicure. From the campfire to the kitchen, all occasions are welcomed. Bonus: The knives are forged with exactness from one blank of high carbon stain-free steel. This particular set includes a 6" cook's knife, 5" serrated utility knife, 3 ½ " paring knife, waiter's corkscrew, kitchen shears, travel-friendly knife sharpener, and zipper-closure travelling case. All of the essentials needed to slice, dice, and open your favourite foods. What do you think of our lunch? Have you used Wüsthof knives? The goods: CLASSIC 7-Piece Traveler Set #8857-Provided by Wüsthof (Buy it here), Eco-printed paper napkins-c/o Gudrun Sjoden, Wicker and leather basket-Vintage (Buy similar), Plastic stemware-(Buy similar), Silver tray-Vintage. Travel mat-Interior Warehouse, Mini cutting board. Affiliate links enclosed. *All opinions expressed are my own. Vegan baguette w/cashew cheese: we used cucumber, butter/romaine lettuce, broccoli sprouts, truffle oil, cashew cheese, and avocado (similar recipe). Ourstanding post is very important to have the proper cuttery for any homecook or chef. It's the first time that I hear of this brand. Good to know that they make knives for travellers.